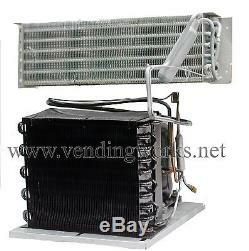 This is a compete cooling deck for a Dixie Narco soda machine model 168, 240, 276 (not E model), 360, 368, 440 or most Dixie Narco stack style soda vending machines that load 12 oz cans two deep, end to end. These cooling decks have been rebuilt, charged with refrigerant, and are ready to install with a few simple hand tools. The item "Dixie Narco Soda Vending Machine Refrigeration Compressor Cooling Deck 300" is in sale since Monday, July 23, 2018. This item is in the category "Business & Industrial\Restaurant & Food Service\Vending & Tabletop Concessions\Beverage & Snack Vending\Parts & Accessories". The seller is "vendaholic" and is located in Rancho Cucamonga, California. This item can be shipped to United States.